It was in early August and the day after Debbie and I had been out for a 35-mile ride on a very hot and humid day that I first noticed the mirror on her Hubbub Cycling mirror didn’t look quite right. Instead of being fully reflective it had taken on a copper-colored hue around the edges with a large, hazy blob covering the middle of the mirror. It appeared as though something that had compromised the silver coating on the mirror such that the copper backing was showing through the otherwise clear glass. When I went to get the mirror off of my own helmet to put on Debbie’s, son-of-a-gun if its perimeter didn’t have the same, sudden loss of silver uniformly around the edge of the mirror. I ended up applying heat to the mirror / mirror housing to encourage the adhesive holding the mirror in place to release so I could get the mirror out of the housing to examine the backside of the mirror. Sure enough, on one mirror the glass and silver coating had de-bonded from the copper backing which was still adhered to the grey plastic mirror housing. On the other, the mirror released with the remaining silver / copper backing attached. After considering my options, I decided I’d take a shot at fixing the mirrors as we really like their large, well-placed mirror design. Given that one of the mirrors lost all of its silver-covered copper backing, whereas the other only lost a thin strip of the silver and copper around the perimeter, I ended up using two different repair methods. Mirror Effect Paint: On the one mirror that had lost all of it’s copper and silver backing, after doing a little cleaning with a solvent I essentially had a clear piece of glass in my hand instead of a mirror. I’d seen a can of “Mirror Effect” paint at the home store when I was picking up some touch-up paint for an appliance and figured I’d see how well that would work on something like a functional mirror vs. just a decorative item. The final result is visible in the mirror to the right in the photo below. Yes, it did in fact turn the piece of glass back into a mirror; however, the reflected image was not of good optical quality. In fact, it was very hazy with some spotting. I made several attempts at coating the glass with the paint, cleaning off the prior coat with solvent between each attempt and it always came out the same regardless of technique used, e.g., many light coats vs. thick coats, air dry vs. heated dry, etc. So, the paint approach was not going to work well on that particular mirror. However, it worked well-enough that I was able to use it on the other mirror with the loss of silver around the perimeter. No, the optical quality wasn’t great, but since it was only around the perimeter it was good enough and returned the mirror to service once the glass reinstalled in the plastic mirror frame. It’s the mirror in the middle of the photo below. Making a New Mirror: For the other mirror where the Mirror Effect paint didn’t delivery the desired optical qualities I went to the auto parts store and purchased a small piece of replacement mirror glass. It wasn’t as thick as I would have liked, but if I could score and snap it with relatively clean breaks I believed I’d be able to get the complex, 7-sided mirror I needed to fit back in the plastic frame. I had enough mirror material to make 3 attempts and my second attempt proved to be “good enough” to return the mirror to service. As feared, the small size of the mirror needed in combination with the cheap, thin-glass used for the replacement mirror did not break as cleanly as a thicker, better-quality piece of mirrored glass would have. It’s the mirror at the left in the photo below. So, all told, I spent $7.00 for the Mirror Effect paint and $8.00 for the auto replacement mirror and returned both of my 7-year old, $29 Hubbub Mirrors to service. 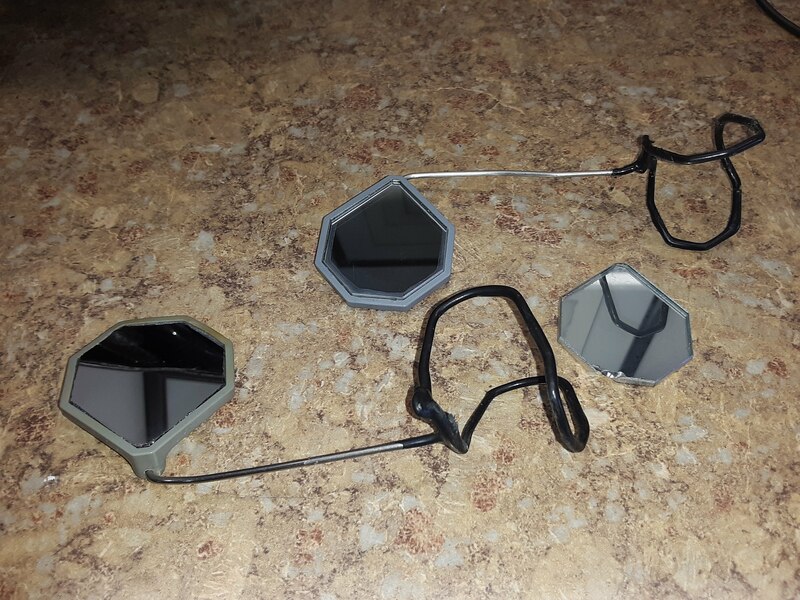 I was good with that as we’re very happy with the Hubbub mirrors and haven’t found any that we’d be willing to replace them with as most use a much smaller, round or rectangular piece of mirrored glass vs. the large heptagonal Hubbub mirror glass. FYI, Hubbub guarantees their mirrors for 5 years. Yes, they do and that’s awesome. Ours made it 7 years before the issue developed. But, on the bright side, all they needed was new mirrored glass… so they live on today! Looks like seven to me. I have one that we bought and did not like. You can have it if you want it. Send me your address and i will send it to you. You can email me at wthais@mchsi.com. Thank you Wayne; it arrived today!